Today we will learn about turbojet engine. Turbojet engine is an Gas Turbine Engine in which working fluid will be gas or air. The gas turbine is an internal combustion engine that uses gases or air as a working fluid to rotate the turbine. This engine takes chemical from the fuel storage and mixes with the air to form a proper combustible mixture. This mixture converts the chemical energy into mechanical energy and this energy is used for aircraft propulsion. Four cycles involved in the Gas Turbine Cycle. Suction or intake of air. Combustion of the fuel: Where the fuel is injected mixed with the sucked air and burnt to produce the energy. Expansion and exhaust or turbine sections: Where the converted stored energy is being used to for propulsion. The turbine section is the most important section of the engine. It produces the useful shaft power to drive the propeller and also to provide enough power to drive the engine accessories. It take place in the engine by converting the gaseous energy into the mechanical energy in the form of shaft power. A large amount of air is being supplied to the turbine to produce the required power. A compressor is used to draw them into the engine and squeezes it to provide the high pressure air to the turbine. The compressor performs this by converting the mechanical energy from the turbine to gaseous energy and obviously in the form of pressure and temperature. Classification of the Gas Turbine Engine. It has been classified into three types. The turbojet engine was the first engine of the turbine engine developed in the history of the aviation industries. All the necessary thrust of these engines comes out through the turbine and the nozzle of the engine, which is called as the core of the engine. It is also called as the jet engine. Turbofan engines have the central engine core and it uses the 10 per cent of the intake air and 90 per cent of the air intake around the core is used to produce the thrust. Because this type of engine produces more thrust when the fuel burned in the core and it mostly used for the passenger aircraft. In these types of engines propeller and the compressor is driven by the energy produces from the exhaust gas stream. It is the hybrid of turbojet and turbo-propeller engine. You might have seen the Indian air force aircraft which is having this engine. Especially these types of aircraft use for cargo. The Turbojet engine was developed for the aircraft before the Second World War. It has an open tube that burns the fuel continuously and produces the required power. In this engine propulsion, third laws of Newton’s “every action has equal and opposite reactions” comes into the picture. When the mixture of air and fuel burn, it produces the high amount of hot gases which expand out from the rear end of the engine, as the hot gases expands, engine is accelerated in the opposite direction. Design of the turbojet engine is like an open tube. A large amount of air getting inside the engine and is drawn into the rotating compressor. There are two types of compressor is used in the engine operation. Centrifugal and axial. In the above figure, an axial type of compressor is used. 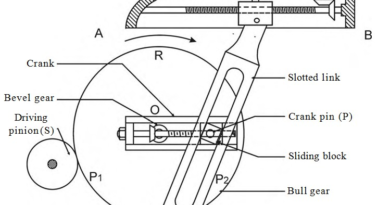 When the air is drawn into the compressor, the pressure of the air increases by passing it through the series of rotating and stationary blades. As the gases pass further in the low volume region pressure of the gas increases and also the gas heated up. Compression ratios of these types of engines are 40:1 and it much higher than the piston engine. The efficiency of the engine can be maximized because it has two different compressors low and high compressor on a different shaft. As you can see in the above figure, fuel is being injected into the combustion chamber by the burner where the compressed air gets mixed and whole air-fuel mixture ignited to produce a high amount of heat energy in the combustion chamber. Gas energy increases rapidly which accelerated towards the engine due to the high pressure created by the compressor. These engines are capable of producing very high temperatures that can melt the material used for the turbine. The experimental data says that the only 12-25 per cent of the air is used for the combustion process and the rest of the air is used to cool combustive gases below the melting temperature of the Turbine. Turbine is connected to the common shaft at which the compressor is mounted. As the heated gas of the combustion chamber passes through the turbine it rotates the shaft and it consumed very less energy. Still, there is enough energy in the gas to do work as it exits the nozzle. As you can see the area of the nozzle, at the inlet diameter is more than the exit diameter. Nozzle converts the high pressure and low velocity of the gases into the high velocity and low pressure at the outlet. Nozzle restricts the flow somewhat before allowing gas to expand and thus it creates additional pressure that results in additional thrust. It has much higher power to weight ratio than the piston engine. 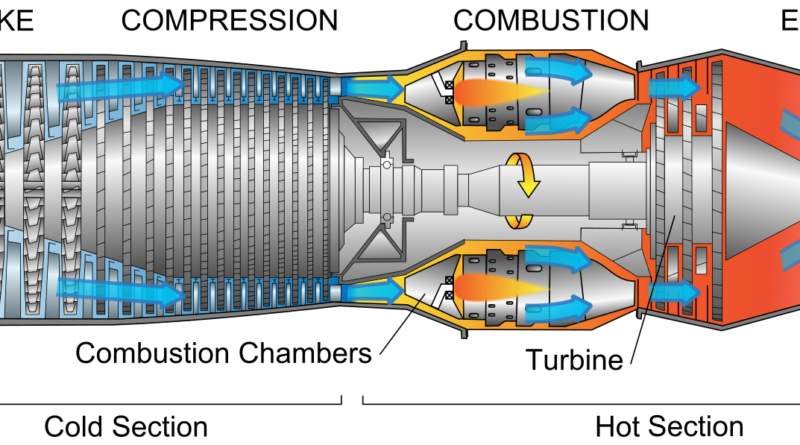 Turbojet engine can operate at very high temperatures. It can produce more thrust than the propeller engine. Mating parts are less so less wear. Low grade fuel can be used. The turbojet engine is less efficient at low speed and at low altitude. ← How Loeffler Boiler﻿ Works?